Wouldn't it be great to have a good handle on what will happen this year to make sure you could plan around it? This book provides a series of answers. 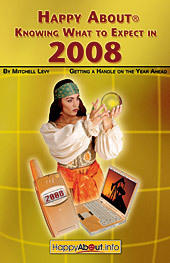 For 2008, we have contributions from 50 executives with a number of interesting predictions. Mitchell Levy has been making extremely accurate predictions since 1998. Read about his previous predictions to see how much credibility you'll give to this year's trends. It's a fun and entertaining read. You will be glad you spent the time and will be happy with you're new perspective. Predictions from "Happy About Knowing What to Expect in 2008"
"The Western world will be in recession in 2008. Consolidation will be the way to maintain stability. Mergers will reach an all time high. Venture Capital will be hard to get in 2008, due to the economic slow down." "The challenges of the financial industry are only in their infancy and I predict major write offs and employee challenges in the first half of 2008." "Major banks globally will collapse and either be bailed out by the central banks or be forced to sell up or merge with other entities." Frank Slootman, President & CEO, Data Domain, Inc.
Kurt Doelling, Vice President Supply Management, Sun Microsystems, Inc.
G. Mark Towhey, President, Towhey Consulting Group Inc.
Peter Ostrow, President and CEO, Technical Communities, Inc.
Mitchell Levy is CEO and publisher of Happy About®. He is also Director of the Silicon Valley Executive Business Program and a partner in CXOnetworking. Mr. Levy has run the management consulting firm ECnow.com since 1997 and sits on the Board of Directors of Rainmaker Systems (NASDAQ: RMKR). He has written 8 business books; is the creator of the Value Framework®; a strategic planning framework; the former Chair of four conferences at Comdex; creator of the world-renown E-Commerce Management Program at San Jose State University; and managed the e-commerce component of Sun Microsystem's $3.5 billion supply chain during his nine years there. He is a popular speaker, lecturing on global business and management issues and can be reached at mitchell(dot)levy@happyabout.com.